Featuring a sleek exterior style and spacious interior design, the all-new Honda Insight delivers an impressive driving experience. The all-new 2019 Honda Insight brings electrified vehicles to the mainstream through a highly-sophisticated and spacious five-passenger sedan. 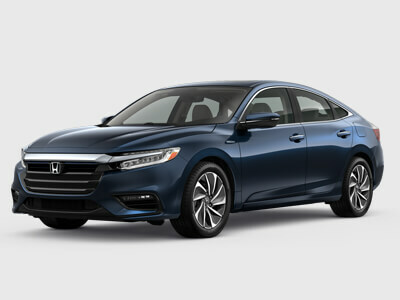 Powered by the third generation of Honda’s innovative and efficient two-motor hybrid system, the Insight offers exciting acceleration—uncommon in its class—thanks to its impressive horsepower and torque. The 2019 Insight LX MSRP $22,830 makes it one of the most affordable electrified vehicles in the market. Can't wait to drive one? Visit your local Honda dealer for more information. 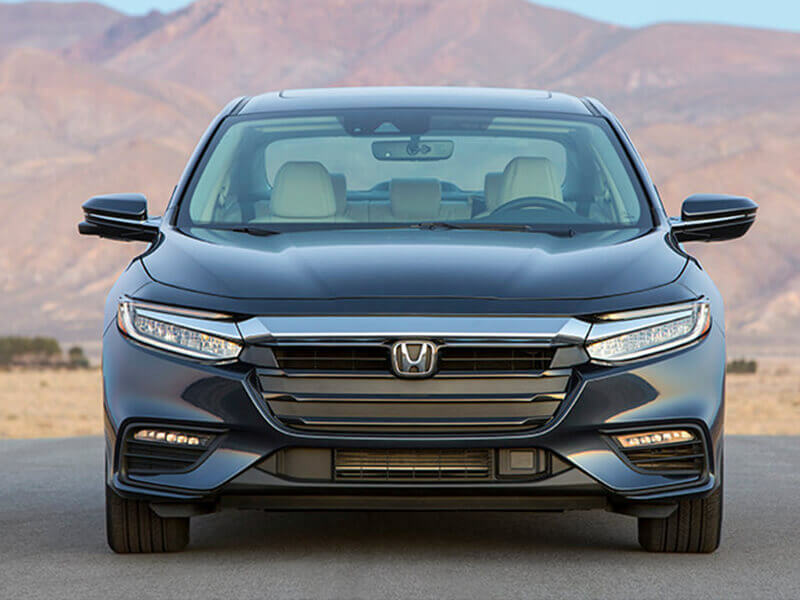 This sleek sedan boasts a low and wide stance, accented by Honda’s signature “flying wing” grille and standard LED headlights with Auto-On/Off. With seating for 5, the elegant yet sporty cabin provides a one-of-a-kind experience for both drivers and passengers. A small camera can see road markers, alert you if you’re about to leave the road and take action to help keep you from doing so. 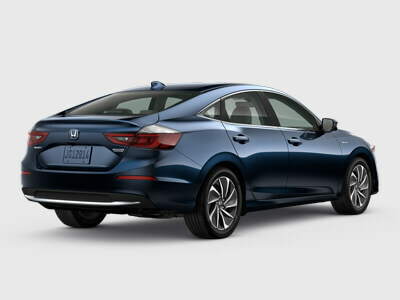 The 2019 Honda Insight boasts a sleek sedan design with sharp and dynamic character lines and a sweeping coupe-like roofline. Three different drive modes: ECON, Sport and EV—allows drivers to customize their driving experience. 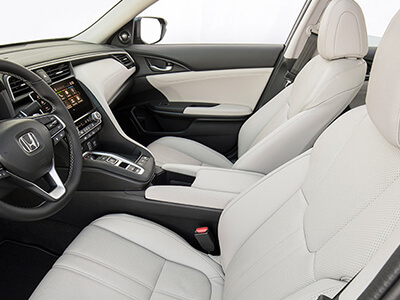 A standard feature on all new Insight models is the Honda Sensing™ suite of safety and driver-assistive technologies, designed to alert you to things you might miss while driving. Helps bring your Insight to a stop by automatically applying brake pressure when the system determines a frontal collision is unavoidable. Long highway drives are easier with LKAS, which subtly adjusts steering to help keep the Insight centered in a detected lane. 55 city/49 highway/52 combined mpg rating for LX and EX trims. 51 city/45 highway/48 combined mpg rating for the Touring trim. Based on 2019 EPA mileage ratings. Use for comparison purposes only. Your mileage will vary depending on driving conditions, how you drive and maintain your vehicle, battery-pack age/condition and other factors. Road Departure Mitigation (RDM) only alerts drivers when lane drift is detected without a turn signal in use and can apply mild steering torque to assist driver in maintaining proper lane position and/or brake pressure to slow the vehicle's departure from a detected lane. RDM may not detect all lane markings or lane departures; accuracy will vary based on weather, speed and road condition. System operation affected by extreme interior heat. Driver remains responsible for safely operating vehicle and avoiding collisions. Forward Collision Warning (FCW) cannot detect all objects ahead and may not detect a given object; accuracy will vary based on weather, speed and other factors. System operation affected by extreme interior heat. FCW does not include a braking function. Driver remains responsible for safely operating vehicle and avoiding collisions. 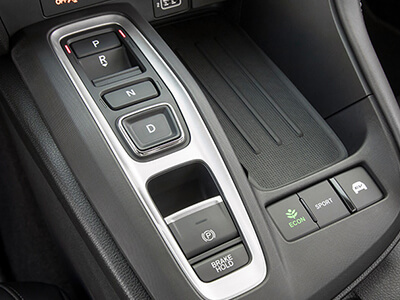 Lane Departure Warning (LDW) only alerts drivers when lane drift is detected without a turn signal in use. LDW may not detect all lane markings or lane departures; accuracy will vary based on weather, speed and road condition. System operation affected by extreme interior heat. Driver remains responsible for safely operating vehicle and avoiding collisions. Adaptive Cruise Control (ACC) with low-speed follow cannot detect all objects ahead and may not detect a given object; accuracy will vary based on weather, speed, and other factors. ACC should not be used in heavy traffic, poor weather, or on winding roads. Driver remains responsible for safely operating vehicle and avoiding collisions. * The Bluetooth® word mark and logos are owned by the Bluetooth SIG, Inc., and any use of such marks by Honda Motor Co., Ltd., is under license.